Coverage: Watch on BBC One, BBC Two, BBC Four, Red Button and up to 24 HD video streams on mobile, desktop, connected TVs and app, plus follow on Radio 5 live and via live text commentary. Vietnam claimed their first ever Olympic gold as Xuan Vinh Hoang won the men's 10m air pistol title. 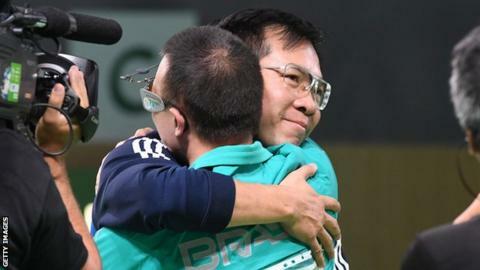 Hoang scored 202.5 points to edge out home favourite Felipe Wu who recorded 202.1 points to clinch silver and Brazil's first medal of the Games. Wu took the lead after the penultimate shot but Hoang denied him with a brilliant final effort. Pang Wei scored 180.4 to win bronze for China, while South Korea's defending champion Jin Jongoh came in fifth.